KBS ì „êµ­ë…¸ë ˆìžëž‘ or KBS National Singing Contest is a popular Sunday noon program that has been running since 1980. It is hosted by the much-loved Korean celebrity Song Hae. The KBS National Singing Contest is brought from one city to another to find amateur talents who will compete in the grand finals in Seoul. The 2014 grand finals was held in KBS Studios in Seoul last December and it was broadcast on national television on December 28th. 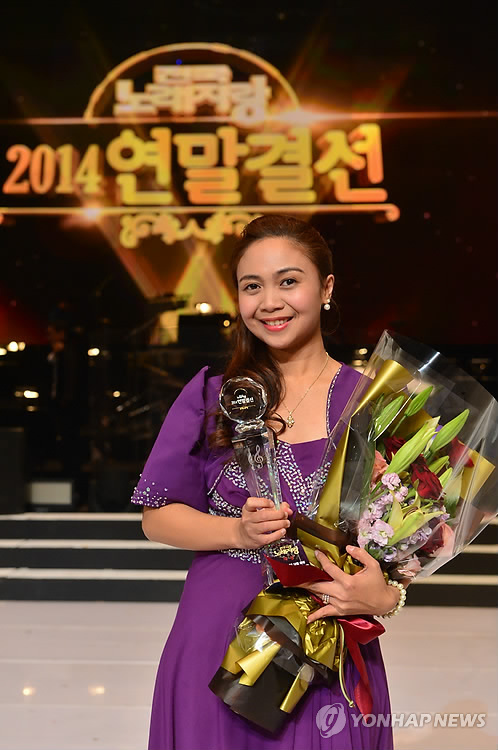 The year’s grand finals winner is a Filipina ~ Helen Mancio Papeleras (Korean: í—¬ë Œ ë§Œì‹œì˜¤ íŒŒíŽ˜ë ˆë¼ìŠ¤). She over scored 21 other finalists to win the trophy and take home 5 million won in cash prize. Helen sang the song ‘ë‹˜ì€ ë¨¼ ê³³ì—’ (Nim-eun Meon Gos-e) during the finals. She saw the movie with the same title with her husband and felt the song so she learned it diligently. Even though she is not very fluent with Korean, she tried to convey the emotion in the song. Her family from the Philippines flew in to show their support and watch her win in the popular singing competition. Helen came to Korea and met her husband, Jung Hwang Gun, in the winter of 2008 in Chuncheon. They got married in April 2019 and blessed with a 6-year old son Seung Hun. She is a homemaker but also works as an English teacher. She has become some sort of a celebrity in her husband’s hometown since joining the KBS National Singing Contest. But like any other immigrant spouse, she tried to adjust to the way of life in Korea. She said that learning Korean is hard. Korean and Philippine culture are different especially when treating the elderly. The Korean language has different words used for the elderly whereas it’s only the addition of “po” or “opo” in the Philippine language. Watch the full broadcast here. Advance to 1:39:26 for the introduction of Helen (contestant #20). Then watch the awarding at around 1:58:00 and you’ll notice how Helen was so surprised when her name was called. My wife Teresita D Gabriel (Thesz) google+ Name:Venus Gracias is working way from me. She has no Mobile phone now. We lost contact. I am scary about her. If something happen to my wife, Because she is not calling me for last 16 days. So if anybody see my wife or know anything about her please call me 010-8691-3227 or inform me through Facebook. My Facebook ID: Information will be highly appreciated with some rewards. I will be grateful to him/her for all the life. My wife could be in Osan, Baran (Hwasong-Si), Masok Khagudanji (Namyangju), Jinjonob ( Namyangju) or Sunson (Jollanam-Do). I left her in Sunson-si (Dowha) on 24 December 2014 In Dowha mat with her new girl friend Marlyn. Please help me to find my wife.Thanks, Rouf Abdur. i was searching for mica, browsed more then got here. wow! feel na feel talaga ni ate yung pagkakanta niya, kuhang kuha niya ung style (reminds of movie Born to Sing) i’m even more proud that she wore a filipiniana dress. thanks for sharing this!